I’m seeing a lot of forex trends playing out on the comdoll crosses these days, and here’s another downtrend I’m looking at on GBP/CAD. What do you think of this setup? The pair is currently testing the descending trend line resistance right around the 1.8500 major psychological level and may be ready to resume its drop. Stochastic is moving down from the overbought region anyway, which means that pound bears are taking control of the game. 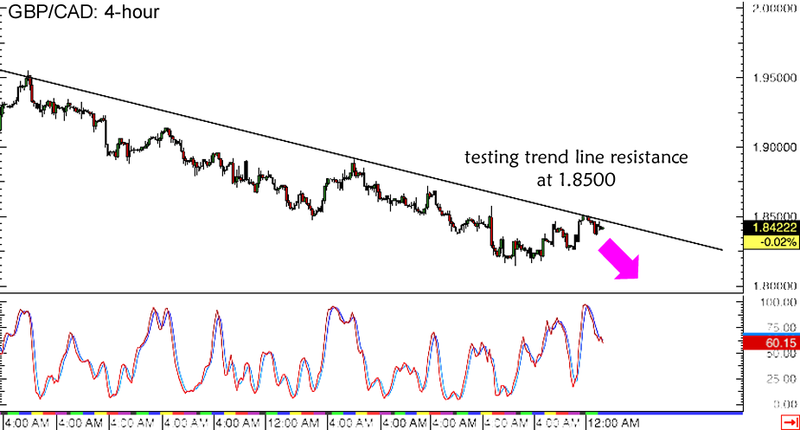 If the trend carries on, GBP/CAD could head back to its previous lows near the 1.8150 area. Just like my previous trade idea on EUR/NZD, I haven’t set any actual orders yet for this one since I’m waiting for more confirmation before shorting. In particular, I’m keeping close tabs on the upcoming U.K. preliminary GDP release today to figure out if the pair is in for more losses or not. I’ll be ready to short at market if the actual report comes in weaker than expected, and I’ll probably consider switching biases if the results are way better than expected. If the GDP reading simply comes in line with expectations, I’ll still retain my bearish bias but I’ll wait for BOC Governor Poloz’s speech during the U.S. session to see if he’ll reiterate his upbeat outlook and spur another leg higher for the Loonie. Stay tuned for my forex trade updates!